Stop by Booth 1441 at the Petfood Forum! See ADF in booth 1441 at the Petfood Forum in Kansas City, April 29-30. 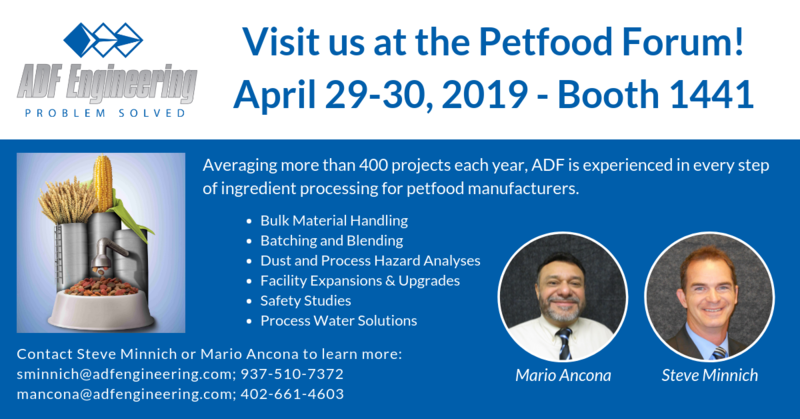 Steve Minnich and Mario Ancona will be on hand to discuss ADF’s capabilities and expertise for the petfood and ingredient processing and manufacturing industries. We look forward to connecting with you! Your partnership with an experienced engineering company can help your operations be more profitable. ADF Engineering offers extensive knowledge and a high level of process and facility engineering experience in the food processing industry. Every year ADF executes more than 400 value-driven projects. Click Here to see the many ways ADF can assist with bulk powder and solids in your facility. The National Fire Protection Agency (NFPA) released a new standard on combustible dusts, NFPA 652, in September 2015. One new requirement introduced by the standard is that a Dust Hazard Analysis (DHA) must be performed for all facilities with combustible dusts on site. The ADF Engineering team understands that water keeps your operation flowing. We also have the experience to integrate water solutions into your plant to maximize efficiencies, reduce energy costs, and increase production consistency.